Isaac Brynjegard-Bialik: Nice Jewish Artist: My new Passover cards are here! I just received a package today from Sunrise Greetings, a card company in Bloomington, Indiana. 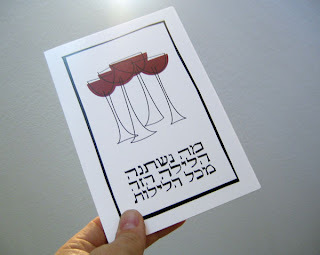 I do some card design for them every so often, and today's box had samples of my latest Passover design, based on the first line of the "four questions" and four cups of wine. I created the illustration and lettering in Adobe Illustrator, and I'm really pleased with the result. If you want to order some for yourself call Sunrise Greetings at 800 457 4045 and ask for the new Passover cards by Isaac Brynjegard-Bialik (item # REAGC.94289)!